Material: Extruded thermo set semi-conducting compound, Carbon paper and carbon loaded polymer. An extruded layer of semi conducting is applied over the insulation layer to insure that the electric stress is homogeneous around the insulated core. The semi conducting layer shall be firmly bonded to the outer layer of the insulation layer. The Purpose of Insulation screen is same as Conductor Screen. Insulation screen is a layer of black cross linked semi conductive compound of approx 1mm thickness and is either fully bonded to the insulation layer, or can be “cold strippable” by hand. When terminating or jointing the cables, it is necessary to remove a part of the insulation screen. Code: IS: 7098, 1554 / IEC: 60502 / BS: 6622 / BS: 7835. It could be also called inner sheath or inner jacket, which serves as a bedding under cable armoring to protect the laid up cores and as a separation sheath. Inner sheath is over laid up of cores. It gives Circular Shape of the cable and it also provides Bedding for the armoring. IS:1554 permits following two methods of applying the Inner Sheath of thermoplastic material i.e. PVC, Polyethylene etc., Which is not harder than insulation. Inner sheath is provided by wrapping at thermoplastic tape. All multi-core cables have either extruded PVC inner sheath or thermoplastic wrapped inner sheath, which is compatible to insulation material and removable without any damage to insulation. Single core cables have no inner sheath. Water blocking is used to prevent moisture migration. Water blocking tapes or Swelling powder should be applied between the conductor strands to block the ingress of water inside the cable conductor (if required). Water blocking Methods to be considered are as follows. Powders: Swell able powders are used as longitudinal water blocks in cables to prevent longitudinal water penetration. These powders swell and expand sufficiently upon contact with water to form a gel-like material to block the flow of water. Water-Blocking Tapes: A water-blocking tape is usually a nonwoven synthetic textile tape impregnated with, or otherwise containing, a swell able powder. Sealed Overlap: To ensure a seal of the overlap, hot-melt adhesives can be used. These adhesives can be extruded or pumped into the overlap seam of a longitudinally formed metallic tape before the seam is closed during cable manufacture. Code: IS: 7098 /IEC:60502 / BS:6622/ BS:7835. Medium Voltage & High-voltage cables have an earthed metallic screen over the insulation of each core. This screen consists one or multi layers of a lapped Conductive copper wires, copper tape or metallic foil, lead, aluminum helically with overlap over insulation screen. The metallic shield needs to be electrically continuous over a cable length to adequately perform its functions of electrostatic protection, electromagnetic protection, and protection from transients, such as lightning and surge or fault currents. (1) Shield Electromagnetic radiation: A metallic sheath is used as a shield to keep electromagnetic radiation in the Cable. The main function of the metallic screen is to nullify the electric field outside of the cable – it acts as a second electrode of the capacitor formed by the cable. The screen needs to connect to earth at least at one point along the route. The capacitive charging current and induced circulating currents which are generated under normal operating conditions will be drained away through the screen. (2) Earth Path: It also provides a path for fault and leakage currents (sheaths are earthed at one cable end). The screen also drains the zero-sequence short circuit currents under fault conditions; this function is used to determine the required size of the metallic screen. Lead sheaths are heavier and potentially more difficult to terminate than copper tape, but generally provide better earth fault capacity. (3) Water Blocking: The other function of Metallic sheaths is to water block and form a radial barrier to prevent humidity from penetrating the cable insulation system. (4) Mechanical Protection: It also provides some degree of mechanical protection to cable. Lightweight and cost effective design. 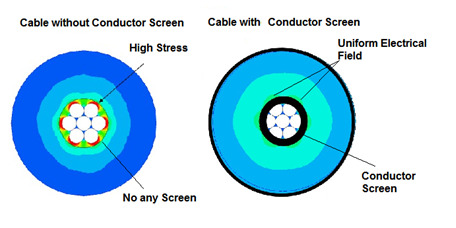 Low resistance of screen may necessitate need for special screen connections to limit the circulating current losses. Does not form a complete moisture barrier unless water swell able tapes are used under and/or over the copper wires. More difficult to terminate – requires special screen connections. Waterproofing guaranteed by the manufacturing process. Excellent resistance to corrosion and hydrocarbons (suitable for oil and gas plants). Lead is a toxic metal whose use is being restricted in some countries. Limited capacity for short circuits. Material: Class 2 – Annealed Plain / Tinned Copper / Aluminum. Usually stranded copper (Cu) or aluminum (Al) is used. Copper is denser and heavier, but more conductive than aluminum. Electrically equivalent aluminum conductors have a cross-sectional area approximately 1.6 times larger than copper, but half the weight. The size of the copper / Aluminum conductor forming one of the cores of a cable is expressed in square millimeters (mm2), and the current rating of the cable is dependent upon the cross-sectional area of each core. Circular Conductor: multi layers of stranded wires are assembled together to make circular shape. To achieve a circular conductor, the number of strands follows a particular progression: 3, 7, 19, 37, 61, and 127 etc, the diameter of each strand being chosen to achieve the desired cross-sectional area of whole conductor. Segment Conductor: Five segments of compacted conductor in triangle shape of 72 degree are assembled together with separation of non metallic tapes to reduce the skin effect which reduce the AC conductor resistance. This screen consists of a lapped copper tape or metallic foil usually less than 1.0mm in thickness, which is the interface between the conductor and the insulation (PVC, XLPE). The Main Purpose of Conductor Screen is to maintain a uniformly divergent electric field, and to contain the electric field within the cable core. Semiconducting screening materials are based on carbon black that is dispersed within a polymer matrix. The concentration of carbon black needs to be sufficiently high to ensure an adequate and consistent conductivity. The incorporation must be optimized to provide a smooth interface between the conducting and insulating portions of the cable. The smooth surface is important as it decreases the occurrence of regions of high electrical stress. Control Electrical Field: Conductor Screen is control the electric field within the insulation and thus the same voltage gradient across it. It also avoids any interaction of the electric stresses due to the voltages on different phase conductors within the same cable. Reduce Voltage Stress Conductor Screen helps to reduce voltage stress at the interface between the conducting and insulating components. 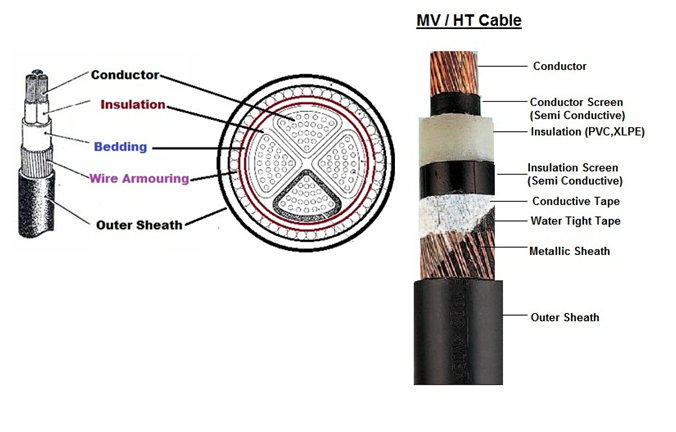 A typical construction for a medium voltage cable consists of an aluminum conductor covered by a screening layer, then by a polyethylene or ethylene propylene rubber insulation followed by a further screening layer. The coefficient of expansion of the insulation layer is typically ten times greater than that of the aluminum and when the cable is at its maximum operating temperature of 90ºC, a large enough gap can formed to allow electrical discharges to occur. The semi-conducting layer then serves to even out the stresses associated with these discharges, which would otherwise attack the insulation at specific points. Uniform Electrical Field: A Black semi-conducting tape is used to maintain a uniform electric field and minimize electrostatic stresses in MV/HV power cables. The external surfaces of the conductor may not be smooth, particularly for stranded conductors, so this layer provides a smooth surface at the same potential as the conductor to keep the electric field consistent all the way around the surface. Without this layer, any small peaks or troughs could cause concentrations of electrical energy which could create small arcs, and over time could erode the insulation layer and cause failure of the cable. Semi-conducting compounds also have the effect of filling in the interstices of the conductor giving a smooth surface for the insulation. This reduces the electrical flux lines around each individual wire that make up the conductor, which can reduce the stress by 10-15%. Material: Non Hygroscopic PVC / Poly propylene Fiber to maintain roundness of cable. In case of three core cables, the three cores are laid up with polymer compound or non-hygroscopic fillers like polypropylene (PP) fillers and a binder tape is applied with an overlap to provide a circular shape to the cable. These binder tapes can be of PVC or foamed Polyethylene. Inner Sheath (Bedding) for Armored Cables. Extruded layer of PVC or PE is applied over the laid up cores for armored cables. Code: IS: 7098, 8130, 14494 / IEC: 60502 / BS: 6622/BS: 7835. Material: PVC, XLPE, Rubber, Elastomer, EPR. This will be an extruded layer of XLPE, Elastomer, Rubber or PVC applied over conductor screen under triple extrusion process along with conductor screen and insulation screen. They are known as PEX or XLPE Cable. It is form of polyethylene with cross links. XLPE creates by direct links or bonds between the carbon backbones of individual polyethylene chains forms the cross linked polyethylene structure. The result of this linkage is to restrict movement of the polyethylene chains relative to each other, so that when heat or other forms of energy are applied the basic network structure cannot deform and the excellent properties that polyethylene has at room temperature are retained at higher temperatures. The cross linking of the molecules also has the effect of enhancing room temperature properties. The useful properties of XLPE are temperature resistance, pressure resistance (stress rupture resistance), environmental stress crack resistance (esc), and resistance to UV light, chemical resistance, oxidation resistance, room temperature and low temperature properties. XLPE cables work for the working voltage of 240 V to 500 KV. The Jacketing Material can be of PVC / Flame Retardant / Flame Retardant Low Smoke / Zero Halogen (LSOH). Applications: Fire Survival, Under Water Cables, Underground burial, installation on trays and ducts. They are known as PVC insulated cables are widely used in various fields. For electric cables the PVC is mixed up with plasticizers. PVC has high tensile strength, superior conductivity, better flexibility and ease of jointing. PVC is a thermoplastic material, therefore care must be taken not to overheat it; it is suitable for conductor temperatures up to 70°C. PVC insulated cables should not be laid when the temperature is less than 0ºC because it becomes brittle and is liable to crack. Applications: Low voltage copper conductor PVC cables are extensively used for domestic home appliances wiring, house wiring and internal wiring for lighting circuits in factories, power supply for office automation, in control, instrumentation, submarine, mining, ship wiring applications etc. These cables are suitable for use where the combination of ambient temperature and temperature-rise due to load results in conductor temperature not exceeding 90°C under normal operation and 250°C under short-circuit conditions. This insulation shall be so applied that it fits closely on the conductor (with or without either separator or screen) but shall not adhere to it. The insulation, unless applied by extrusion, shall be applied in two or more layers and it is applicable to cables with a rated voltage up to 1 100 volts. Applications: Welding Cables, Ship wiring cables, Pressure Tight Cables and cables for submerged connection, Railways locomotives and coach wiring cables, Mining Cables. For high-voltage cables the insulation is ethylene propylene rubber (EPR) and for low-voltage cables it is polyvinyl chloride (PVC). EPR has good electrical properties and is resistant to heat and chemicals; it is suitable for a conductor temperature up to 85 ºC. These are used in electric utilities such as the generation and transmission of electricity. Long service life under normal environment in Nuclear and conventionally powered generating stations plus safety considerations are the significant factors of these electric appliances. When exposed to fire, Silicon offers circuit integrity, low smoke evolution, and freedom from halogen acids.